Do you want to share your love of books and reading? Every summer, students hone their public speaking and organizational skills by volunteering for the library’s Summer Reading Program, encouraging thousands of readers of all ages to read and earn prize books. PARENTS: Volunteering for the library is both a work experience and an educational opportunity. It is a substantial commitment of time and enthusiasm. To ensure that your child successfully honors this commitment, your support is vital. 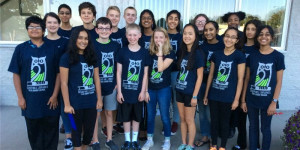 Your child may apply to volunteer at either Bethany or Cedar Mill Library, but please note that mandatory Orientation and Training are conducted at Cedar Mill Community Library only. • Can commit to at least twelve 2-hour shifts between June 1-Aug 26. • Ensure sign-up information is complete. • Keep the Summer Reading Table tidy, organized and stocked with supplies. 1. Complete a Summer Reading Volunteer Application online by April 30. Established in 2009, the teen library council offers teens in grades 6–12 the opportunity to have input in the way the library serves teens. The council meets the second Monday of every month from 5 PM to 6:30 p.m during the school year. Most months, we meet at the Cedar Mill Library, but we occasionally meet at our Bethany location. Meeting attendance and participation in events are mandatory. Plan, promote, and help out with teen library programs. Recommend books, movies, music & video games to library staff. Recommend teen collections to the public with displays, book reviews, podcasts and social media posts. Promote the library to their peers in person, on social media, with videos and through outreach. The application process is open sometime in May and June each year. The top candidates will be contacted for interviews. After the interview, the teen council advisers and longtime council members will make decisions on who will join the council for the next school year. Applicants will be notified after the interview process. Shelving is one of the most important volunteer jobs at the Cedar Mill libraries. It is physical as well as mental work, and a great way to get started as a library volunteer. All other opportunities in the Circulation Department build on skills learned in this position. Be part of the team that keeps the library neat and in order so that patrons can find the materials they are looking for. Responsibilities: Shelve library materials; maintain neat and orderly shelves. Qualifications: Must be at least 14 years old. Must follow direction well. Able to concentrate and pay strict attention to details. Able to alphabetize and organize. Able to lift books and push book carts. Bending, kneeling and stretching required. Must be able to work independently after being trained. Second Edition is an upscale resale shop, a fundraiser that directly supports the library. It is an excellent place to gain vital job skills and experience. Learn to run a cash register and credit card reader, how to deliver great customer service, and how to sort, price and display merchandise. One 3-hour shift weekly for a minimum of 6 months is required. Cashiers ring up sales; keep the shop looking clean, organized and inviting; and provide friendly customer service. Responsibilities: Greet customers, answer questions; ring up sales using the cash register and credit card machine; hang up clothes; light dusting and cleaning. Qualifications: Cashiers must be at least 15 years old; be able to stand for the 3-hour shift; be able to interact pleasantly with customers; use the cash register once trained; be accurate; have good verbal skills. Commitment: One 3-hour shift weekly for a minimum of 6 months.